It is Thanksgiving season and you know what that means! Nowadays people are more familiar with their turkey cuts. Ground turkey has taken off, however, turkey legs, half-breasts, thighs, etc. make for great holiday meals. 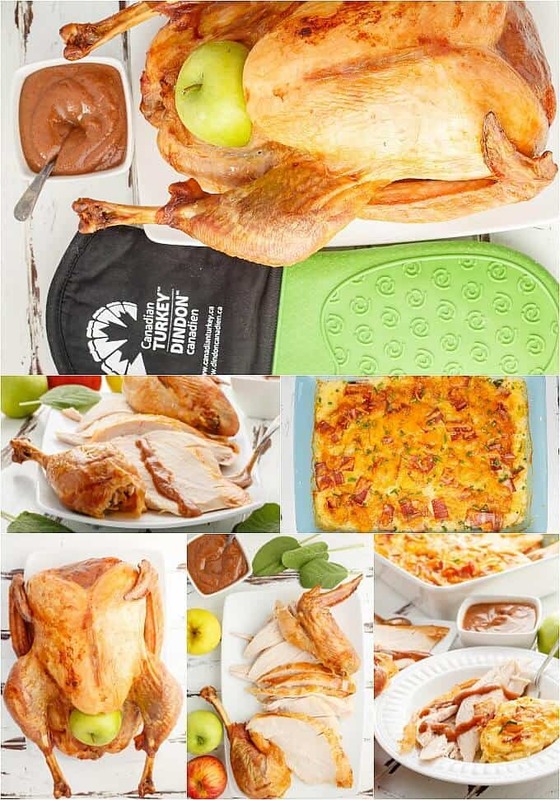 Some people have large families, others are small and simple, and Canadian Turkey can help you out this holiday season no matter what your lifestyle! For our Thanksgiving, I like changing things up. 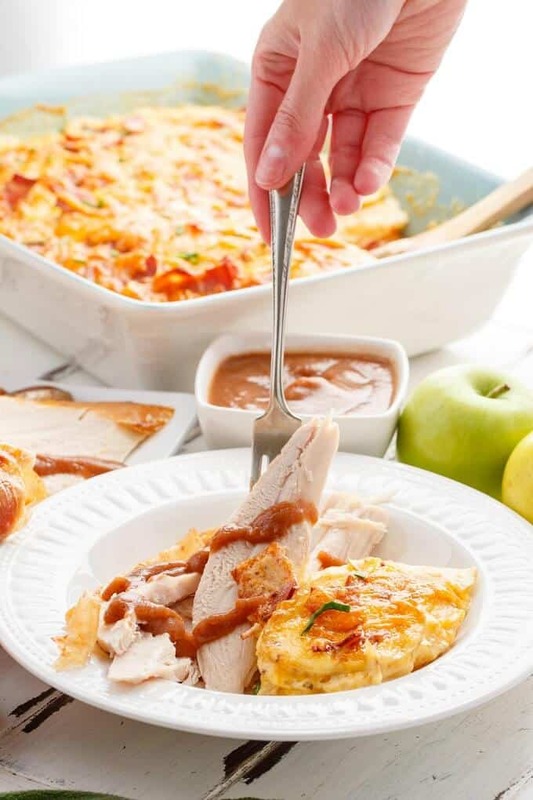 This roasted apple butter turkey pairs perfectly with turkey bacon scalloped potatoes! Turkey all around! Originally I was going to cook the apple butter with the turkey, but I have found my new turkey methods really yield a moist and tasty dinner. How do I manage this?! Well, brining is essential I believe. What a difference it makes. My husband says he can 100% taste and see the difference. And really, brining is not hard at all! To think I was afraid at one point 😉 Honestly though, you can throw in whatever you like flavour-wise, but as long as you have a good balance of salt and water, you are golden! Secondly, after the brining stage, I like to pat my turkey dry and allow it to sit, uncovered, in my refrigerator overnight. This allows the turkey skin to dry out, and when we go to cook it, it results in the crispiest skin ever! Seriously, no butter, no oil, nothing. I put my turkey into the oven dry. And it comes out anything but dry! 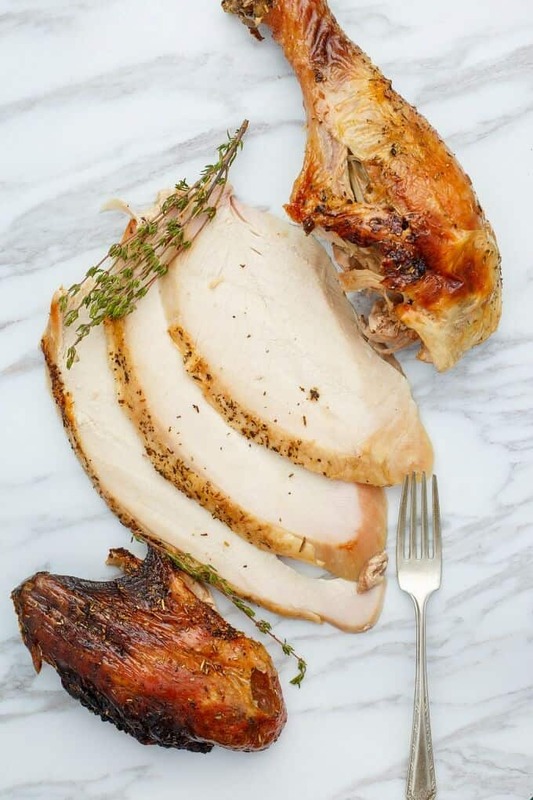 With these two techniques you are always rewarded with the perfect roasted turkey. If brining, DO NOT salt your turkey before cooking it. The brine adds so much saltiness and if you season your turkey more, you are going to over-salt. I know everyone says salt, salt, salt, but in this case, DO NOT! 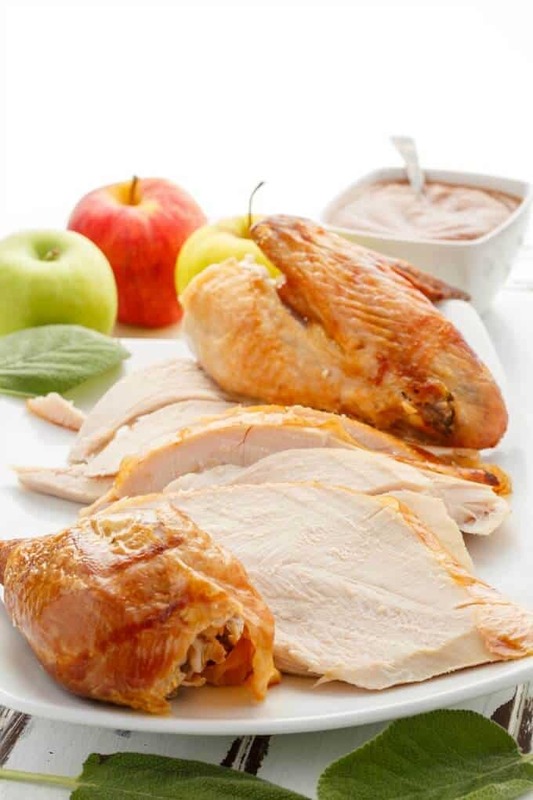 This roasted apple butter turkey uses my homemade apple butter (made in the slow cooker!) You can have the apple butter cooking all day and ready to serve alongside your turkey. Or, if you are like me and like to plan ahead, feel free to make the apple butter in advance! Then you can choose if you want to serve it cold, warm, or hot! Alongside this roasted apple butter turkey I went with turkey bacon scalloped potatoes. 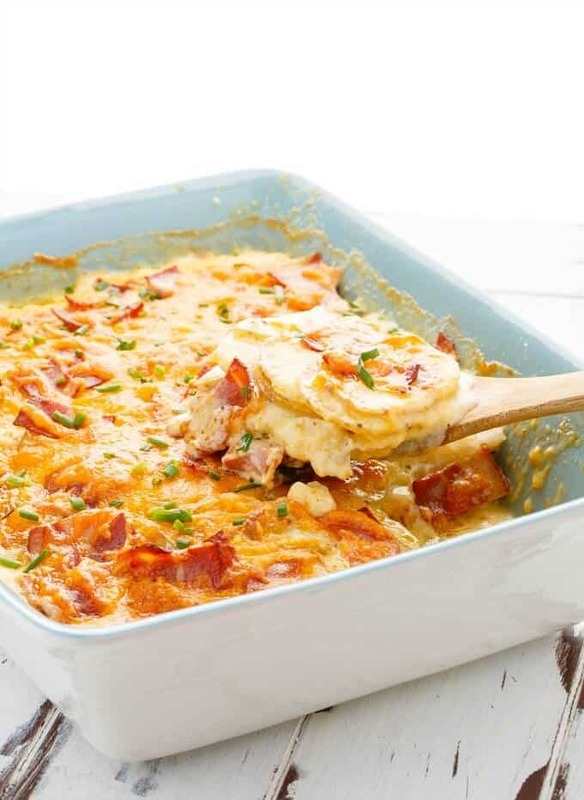 No party is complete without scalloped potatoes, especially if they utilize turkey bacon! Looking to make your Thanksgiving easy and enjoyable this year? Remember these little facts! Brine your turkey! This takes 8 hours or more so plan ahead. Remove turkey from brine, pat dry, and allow to dry out in the fridge overnight. 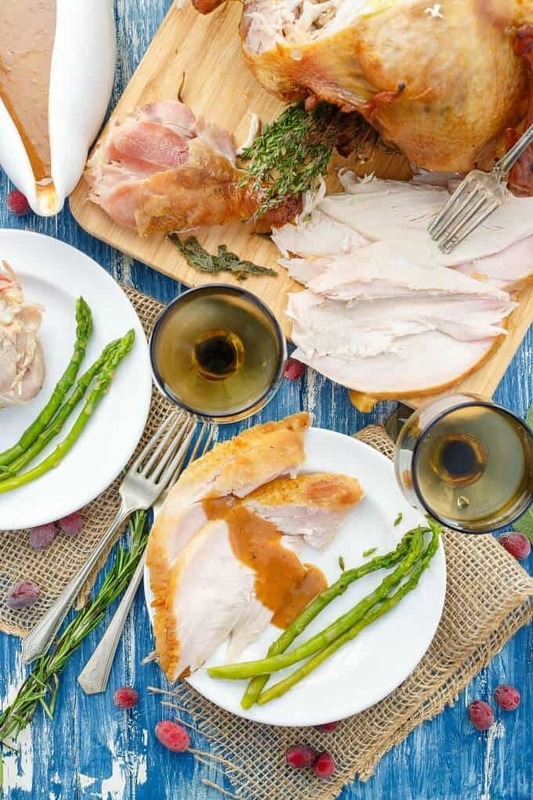 Save time on Thanksgiving day by prepping what you can the night before! Hint hint, apple butter! The slow cooker is your friend for side dishes to keep the oven free for your turkey! Meat thermometer is your friend: I use one to ensure I don’t overcook my meat. The combination of sweet and salty is divine here when it comes to the salty turkey paired with sweet apple butter! 1 batch homemade apple butter or store-bought! Place into oven, uncovered, and lower heat to 350F. Cook for 1 hour, remove to baste. If wings are looking dark, you can cover them with aluminum foil. Return to oven and roast for 30 more minutes; baste again. Cook for another 30 minutes, and baste. Cook time is 2 to 2 1/2 hours, or when your breast reaches 170F. Remove from pan and wrap in aluminum foil. Allow to rest for at least 20 minutes before slicing! Serve with apple butter over top of turkey meat. Place a large frying pan over medium-heat. Add bacon and cook until crispy, about 8-10 minutes. Heat a medium-sized pot over medium heat. Add in butter, waiting until it melts and is bubbling before adding flour. Whisk very frequently for about 5 minutes, or until the roux has deepened in colour. Add garlic in the last minute and cook until aromatic. In a separate bowl, mix together the milk, cream, salt, pepper, cayenne, oregano, and mustard. Pour into roux, whisking constantly. Bring to a boil and add 2 cups of cheese. Stir until melted and blended. Remove from heat. Preheat oven to 350F. Grease a 9x13 inch baking dish. Place in enough potatoes to cover the bottom. Add some sauce and sprinkle with bacon. Repeat again until no potatoes or sauce remains (I save a bit extra sauce to pour over the top potatoes for extra coverage and creaminess.) Reserve some bacon and cheese for topping. Bake for 1 hour 10 minutes, uncovered until potatoes are soft. In the last 10 minutes, top with bacon and cheese! 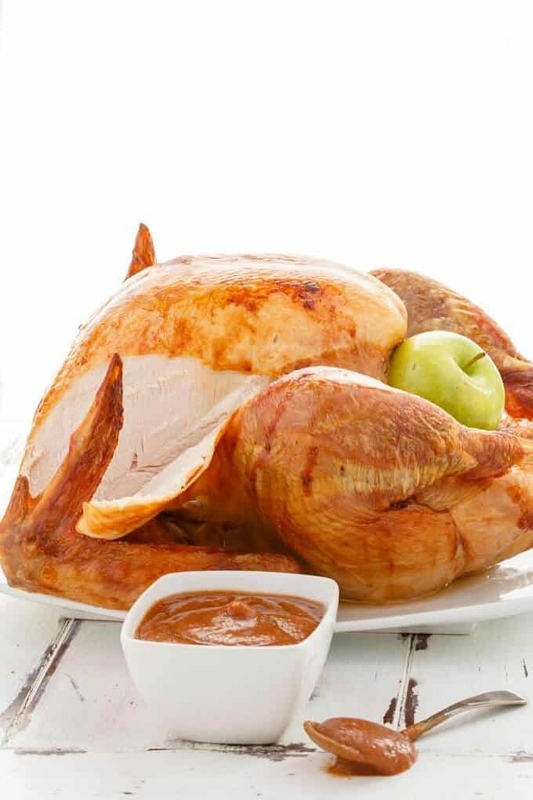 If brining your turkey, don't salt your turkey afterwards, it will be salty enough! No need for oil or butter on the skin as the drying in the fridge will result in a crispy turkey skin!